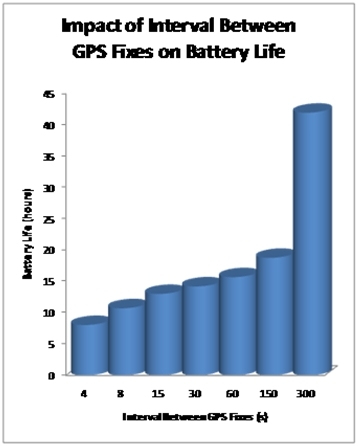 Every time a position is calculated using a positioning system such as assisted GPS, there is cost in battery life to the device, as well as a potential financial costs to the cellular carrier if the positioning system is licensed from another vendor. Each calculated position is also typically stored in the database, resulting in storage cost for each calculated position as well. Traditional LBS application developers will pick a single interval of time (e.g., 5 minutes) between positioning system updates that does not change over the life of the application. As a result, app developers must choose from frequent updates (e.g., every 4 seconds) and very short battery life (e.g. 4 hours), or longer intervals of time between updates (e.g., every 5 minutes) and reasonable battery life (e.g., 43 hours). GPS Auto-Sleep (i.e., Position Recalculation Management)  dynamically varies the interval of time between location updates depending on the real-time needs of the system, and an estimation of whether the user is currently moving or is standing still. Numerous states, and gradual state transitions, are used to reduce the impact of GPS outliers. The above figure shows the battery life benefits of this technology, while still preserving the ability to quickly sample a user’s location while they are moving. The current core technology estimates the correct state (e.g., moving or stationary) around 89% of the time, and recent experiments with modified Kalman Filters  extend this to 93%. Interested in more details? Check out our original paper from the UBICOMM 2008 conference in the reference at the bottom of the page along a paper on the improved version using Kalman Filters, and download our powerpoint presentation on the patented GPS Auto-Sleep technology. Isaac M. Taylor and Miguel A. Labrador, “Improving the Energy Consumption in Mobile Phones by Filtering Noisy GPS Fixes with Modified Kalman Filters,”Proceedings of IEEE Wireless Communications and Networking Conference, March 28-31, 2011. Paper, Presentation.